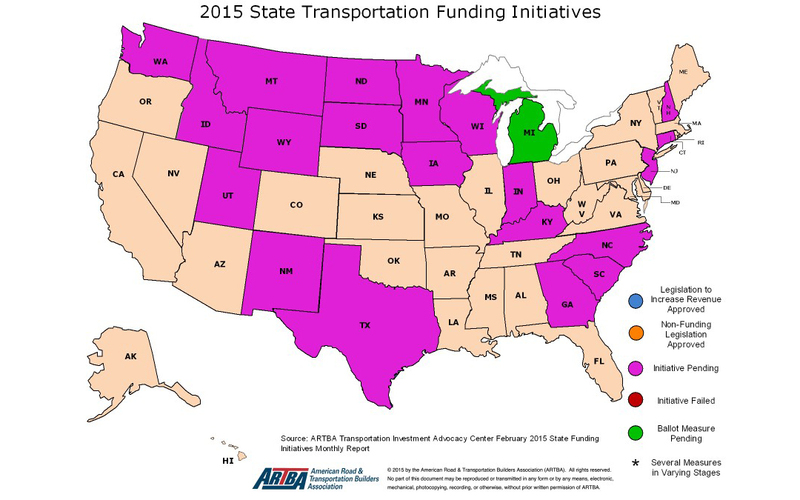 More than half the states are considering new transportation funding legislation so far this year, according to the Transportation Investment Advocacy Center’s (TIAC) third 2015 report on state legislation. TIAC staff have tracked 105 bills introduced in 30 states during 2015, and over 110 bills are currently pending legislative action. Six bills have been approved this year, totaling approximately $1.085 billion for transportation funding. Thirteen states— Georgia, Idaho, Minnesota, Missouri, Montana, Nebraska, New Hampshire, New Mexico, New Jersey, South Carolina, Texas, Utah, and Washington — are currently considering legislation to increase their gas tax or sales tax on gasoline. Three states— Connecticut, New Hampshire and Texas— are considering legislation to protect their transportation funds from diversions. Three states— Arkansas, Michigan, and Missouri — have pending legislation to convert the flat-rate excise tax on fuel entirely to a variable-rate tax. Additionally, a bill in Maine proposes indexing the current flat gas tax to the Consumer Price Index. Eight states— Connecticut, Georgia, Maine, Massachusetts, Minnesota., New York, Washington and Wisconsin — have proposed bonds to pay for transportation projects.